Approaching the doors to the studio, I hesitate for a brief moment, tightening the hood of my down coat against my neck, before entering and making my way up the stairs. It’s my first ballet class in, literally, decades. 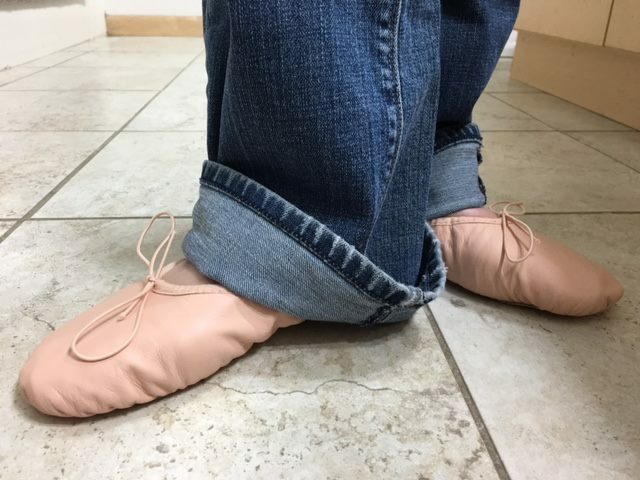 As I unzip and hang my outerwear, remove my shoes and don my pink leather ballet slippers, which bear not a scuff, I recognize the instructor from her website and notice, beyond her, a montage of ballet, lyrical and modern dancers grand jetéing their way across the floor. Indeed, I am able to identify several of the dancers from Juxtaposed, a performance I attended a few weeks prior, before I had grown attached to the notion of reclaiming my long-lost ballerinahood. 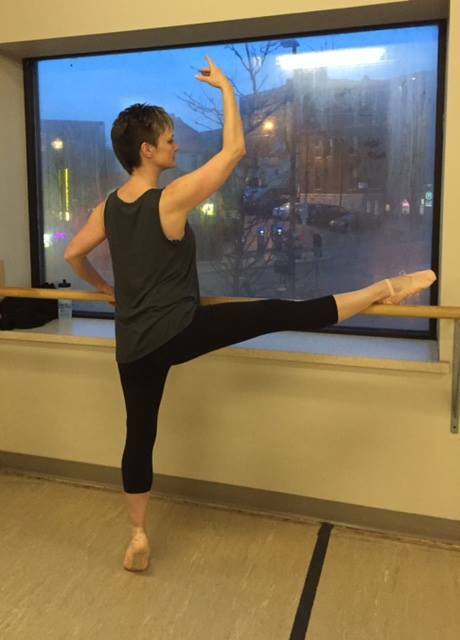 Once the lean and supple bodies clear out, a few minutes past the hour, we adult beginners take our places at the barre. She tends to the music, and I steal a look over my left shoulder and into the mirror. With my faux-hawk and nose ring, I resemble an aging riot grrrl far more than a silken lily. First and second position prove effortless, and fifth seems fine, too, once I adjust the placement of my hips in order to compensate for my 16 millimeter leg-length discrepancy. As the joint knocks into place, I am reminded that I’m not exactly the quintessential physical specimen, given the cadaver tendon holding my knee in place, a relatively recent labral tear, two bulging discs in my cervical spine (in addition to the three herniated in my lumbar region) and a rather impressive bunion. There’s tremendous freedom in there being little left to lose. Having worked through the gamut of rond de jambes, developpés and grand battements, we are instructed to choose the appropriate barre height for our stretches. I select the mid-height barre along the windows, facing State Street. I bring my left arm overhead and lean toward my right leg, placed precariously atop the wooden rod. As I rise, my eyes meet those of a young man shivering in his peacoat at the bus stop, who looks up with interest into the second floor studio windows, lit against the darkness of the mid-winter’s evening. Mind you, back in the day, I was incredibly flexible, I silently inform him. And, don’t you worry, I’ll get there again. He lowers his gaze as we move to the center of the room. Heidi directs her focus upward, toward the ceiling, seeking inspiration. She then moves her feet, trying out patterns. She points, pliés, then lengthens in a relevé passé. Positioning myself as instructed, I lift onto my right toes and bring my left foot to my right knee. Passé! I teeter, then land with a thunk. I set myself up brilliantly. This time, my right knee is bent and my left foot points. Up to passé! Ms. Francis, back at Forest Hills Dance Academy in 1978, now likely long dead, would surely have snapped her fingers. I could hear it, still. By the time I reach the far wall, I acknowledge to myself that a couple glasses of pinot noir could easily have elicited the same dizzying effect without my ever having left the apartment; but, I realize, I’m having way too much fun. Back and forth we go across the room, each time a bit more polished than the last, until I find myself completing most of the turns with control and some degree of grace. At the end of the last pass, we all stand with our hands upon our hips, looking through one another, cross-eyed, into the middle-distance, waiting for the room to slow its spinning. “Okay, back to center.” Heidi leads us through the steps of an elaborate and undeservedly affirming stage bow before rising and, yes, clapping. I gather my water bottle and hoodie from the window sill and wait a beat in hopes of thanking the instructor. “Thank you,” I respond, flattered. “Please, do feel free to offer corrections. I’d like to reclaim whatever semblance of potential I have left.” Always and forever, aspiring to be the teacher’s pet. My smile lingers as I change into my street shoes, slip on my coat and bound down the stairs, into the night. As I cross State Street and then Gorham, against the light, I do a few calculations. By the age of 92, I’ll have accumulated 50 years of ballet training, not counting my dalliances with dance as a girl. Thank goodness, I think, I’m starting so young. A graduate of Northwestern University with a degree in literature, Kelly Sauvage Angel is the author of Om Namah… (published under Kalyanii), a collection of poetry, two stage plays, dozens of short stories and hundreds of articles. After surrendering to the healing touch of her massage therapist and downing a couple anti-inflammatories, she most enjoys wiling away her free time manifesting her culinary inspirations and reveling amid the magnificence of nature. Her debut post-adolescent dance performance can be witnessed at this year’s Atwoodfest in Madison, wisconsin. You give me hope! Today I am starting my first hatayana yoga class….I’m 73!